Former NBA star Dennis Rodman presents the book The Art of the Deal to North Korea's Sports Minister Kim Il Guk last June in Pyongyang, North Korea. Until this week, Rodman was believed to be the only person who had met both Kim and the U.S. president. "Well done, President Trump. You're on the way to a historical meeting no U.S. president has ever done," the former NBA star told The Associated Press after news broke Thursday of plans to arrange a meeting between the Trump and Kim. And Rodman is right. No sitting U.S. president is known to have ever met with a North Korean leader. Jimmy Carter, in 1994, and Bill Clinton, in 2009, both did so after they left office. "Please send my regards to Marshal Kim Jong Un and his family," Rodman added. While Trump and Kim were trading insults last year, Rodman was among the few who seemed to anticipate the possibility of a diplomatic breakthrough. 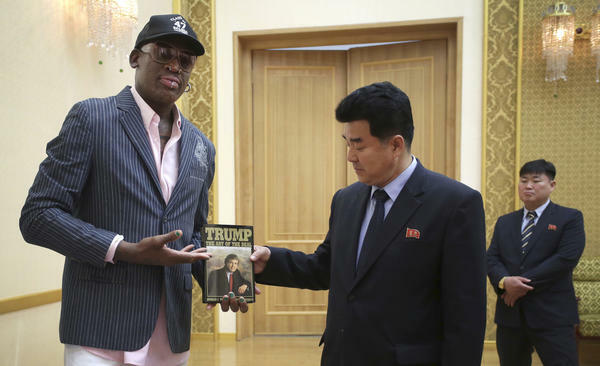 On a visit to North Korea last June, Rodman delivered a copy of Trump's book, The Art of the Deal, to the North Korean leadership. Back in 2013, Trump dismissed Rodman from The Apprentice when his team made the unforgivable mistake of presenting an advertising poster that misspelled the name of Trump's wife Melania, writing "Milania." "It's not my fault," Rodman protested, blaming his teammates. Until this week, Rodman was believed to be the only person who had met both Trump and Kim. The exclusive club expanded to two members as South Korean national security adviser Chung Eui-yong went to Pyongyang to meet with Kim, then came to the White House to brief Trump on Thursday.